The gum area will be cleaned out a bit, debris removed and the pus is allowed to drain. Hot salt water or chlorrhexidine mouthwash can be used as an aid upon treatment. Antibiotic will be given to reduce swelling, kill or inhibit bacterial growth. However, antibiotics for gum diseases are unnecessary unless systemic upset is present. Underlying periodontal disease also treated. 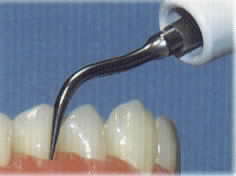 Metal probe is used to measure the depth of the gingival sulcus (the groove between gums and teeth). The probe is inserted beside tooth beneath the gum line, usually at several sites throughout mouth. Radiographic (x-ray) examination is needed to help in confirming the disease. Panoramic radiograph is taken to see the present of bone loss surrounding the tooth. The initial phase- the aim is to control or eliminate and arrest further progression of periodontal disease by the removal of plaque and other contributory factors. The corrective phase-the aim of corrective techniques such as scaling, root planning,periodontal surgery, restorative work, endodontics and occlusal adjustment is to eliminate periodontal pocket, arrest loss of bone and create free-plaque environment. The maintenance phase-the aim is to reinforce oral hygiene to prevent recurrence of disease. Scaling is there removal of plaque and calculus from the tooth surface using hand instrument or ultrasonic scaler. 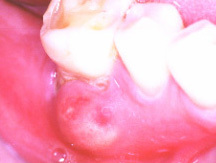 Most of the treatment to get rid of gum disease involves root planing and curettage (cleaning) under the gum margins. Root planing smoothes the root surfaces, discouraging further accumulation of calculus. In more advanced cases, the treatment may become more complex. If after removal of the deposits, fairly deep pockets remain, they can be eliminated by a minor surgical procedure called gingivectomy. This is done under local anesthesia. A similar procedure, called gingivoplasty, is used to remove excessive gum tissue and to provide a new and healthier shape for the gums. In some cases, flap procedures are performed. Other technique may involve is guided tissue regeneration. Antiseptic mouthwash for gum disease can be used to aid mechanical control of plaque. Chlorhexidine gluconate based mouthwash in combination with good care of oral hygiene may cure gingivitis, although they cannot reverse any attachment loss due to periodontitis. However, problems with their use include the unwanted side effects of such chemicals and development of resistance. The key to prevention is regular and thorough plaque removal. Gingivitis can be prevented through regular oral hygiene that includes daily brushing . Tooth brushing requires a brush, identically with a small head and even nylon bristles, which should be renewed at least once every 6 month. Brushing technique recommended is to use vertical movements, always from the gums at the edge of the tooth. However, other modified technique also can be used a long as it does not irritate gums. Teeth should be brush at least twice daily — in the morning and before going to bed. Brushing alone is unlikely to clean the interdental spaces adequately. Flossing once a day helps to eliminate plaque on the proximal faces, these are the teeth’s sides that touch each other. Interdental toothbrushes also can be used for cleaning interproximally. Mouthwash or Hydrogen Peroxide can be helpful, usually using peroxide or saline solutions (water and salt), alcohol or chlorhexidine. Vitamins for gum disease that can be taken include vitamin A, C and B complex. Regular dental check-ups are important as well. This requires a full oral examination, including probing for pockets as part of routine examination. What should I do now to save my teeth and health? Same as the previous 12 years, in fall 2007, dental hygienist cleaned my teeth, dentist checked them and all was fine. In fall 2008 in a different office, hygienist refused to clean my teeth saying there was too much infection and if I didn’t do something, I would lose my teeth. The dentist checked and teeth and gums seemed fine to him. However, the hygienist would not budge. How could my teeth change so terribly, so fast? I had been under great family stress but it ended within a year. I’ve been left on my own for a year, since fall 2008, to deal with painful chronic sinusitis which I know caused extreme pain in front top teeth and gums. And, I’m sure that’s how the infection got into my gums. Present dentist disagrees and refuses to believe my research. I have had healthy gums and never even had a cavity from age 17 to 55, now 57. Stress, according to my previous dentist, caused two abcesses in my late 40s. He saved the two back teeth. That dentist passed away and a new dentist treated me for an abcess last year. It took from January to September 2008 and several visits to him and a root canal specialist dentist but my back tooth was saved. Now I have flare-ups of extreme pain in front top teeth, chronic sinusitis and I have one slightly loose front top tooth. I do not want to lose more bone or any teeth. I brush, use pick and warm salt water rinses two, three or more times a day. I eat fresh organic apples and carrots, regular oranges and no sugar juice, salmon, organic eggs, rye bread and crackers, yogurt without aspartame, some coffee, a bit of black tea, lots of Britta-filtered water, and less and less dairy (allergic to it), some porc and beef, honey or brown sugar in my coffee. I could eat more vegetables. 4 oz/day of Flora’s Flor-Essence herbal tea every 3 months for preventive and maintenance measures. I do have environmental illness: chemical sensitivities condition and my immune system is low. I am not allergic to plants or animals, but I am to man-made products like perfume, terpentine, oil paint, cigarette smoke, glues, etc. Amoxicillin works well on me but stronger antibiotics do not. I’ve tried several with no results except for mild to serious side effects. My dentist refuses to prescribe any meds. I’ve had no family doctor for 7 years. My new family doctor will probably help me with this though I cannot see him until November. Is there anyone out there with advice or helpful solutions? I am also ready to use alternative medical/dental home remedies. We have no alternative practice dentists.